Jerome A. (Jerry) Offner began working as a volunteer with the museum in 1984 and curated two exhibits on aspects of the Americas in the 1980s. Jerry is an expert on the Aztecs of Mexico, their history, culture and overall graphic communication system, including their writing system. 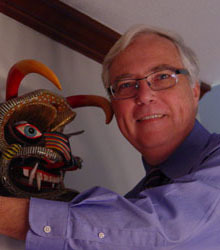 In 1983, Jerry “wrote the book” on the Aztec legal system and has continued to conduct research and publish articles through the present day on topics including religion, economics and history. He specializes in the beautiful and colorful “codices” or native pictorial documents from before and after the Conquest in 1519 AD. Currently, he is assembling a team in Europe to investigate the greatest of the Aztec pictorial histories—the Codex Xolotl from the city of Texcoco, which reports on many events of the remarkable life of Nezahualcoyotl who ruled that city 1431-1472 AD. This history, kept in the Bibliothèque Nationale de France in Paris, illustrates in considerable detail more than 260 years of history before 1431 AD on ten pages and three fragments made of native paper. It records the migrations, invasions, wars, marriages, births, and lives in the histories of the many different peoples who came to be known as the Aztecs in what is now the central part of Mexico. Jerry is also an expert in contemporary masks and textiles of Mexico, with additional interests in Africa and the ancient Mediterranean. He read, writes or speaks English, Spanish, French, Latin, ancient Greek, and classical Nahuatl, the language of the Nahua (Aztecs) of Mexico. Jerry received his B.A. in 1972 from the University of Chicago and his MPhil and PhD from Yale University in 1975 and 1979. He was been awarded grants by the National Science Foundation, the Doherty Foundation, as well as the Fulbright program. His book was awarded the Howard F. Cline Prize in 1985. He is active in presenting papers at professional meetings, both in English and Spanish. Some commonalities among lost and extant pictorials from eastern central Mexico (Santa Fe, Ethnohistory meetings, 2005). Pictorials first, texts second: The proper use of the Codex Xolotl and its dependent sources (Sevilla, International Congress of Americanists, 2006). Improving Western Historiography of Texcoco (Reconciling Portraits of Pre-Hispanic Mexico: Texcoco and Current Aztec Studies, University of North Texas, Denton, Texas, 2010). Códice de Xicotepec: Recovering the Content of the Foundational Section 1 (American Society for Ethnohistory, Pasadena, CA, October, 2011). “Production” of Indigenous Pictorial Manuscripts to the East of the Basin of Mexico (International Congress of Americanists, Vienna, Austria, July, 2012). (in Spanish). “Códice Xolotl: su origen y usos” IV Simposio Internacional sobre Códices del Centro de México. Universidad Complutense de Madrid, October, 2012). (in Spanish). 1979 A reassessment of the structuring and extent of the empire of Techotlalatzin, fourteenth century ruler of Texcoco. Ethnohistory 26(3):231-41. 1980b Aztec political numerology and human sacrifice: The ideological ramifications of the number six. Journal of Latin American Lore 6(2):205-15. 1982 Aztec legal process: The case of Texcoco, in: Proceedings of the Conference on Late Post-classic Central Mexican Iconography, Elizabeth Hill Boone, editor, pp.141-157, Washington, DC, Center for Mesoamerican Studies, Dumbarton Oaks. 1983 Law and Politics in Aztec Texcoco. Cambridge: Cambridge University Press. 1984b The distribution of jurisdiction and political power in Aztec Texcoco: Subgroups in conflict, in: Five Centuries of Law and Politics in Central Mexico, Ronald Spores and Ross Hassig, editors, pp. 5-14. Nashville, Vanderbilt University Publications in Anthropology, no.30. 1993 Dueling rulers and strange attractors: Some patterns of disorder and killing in Aztec society. Political and Legal Anthropology Review 16(2): 65-73. 2010 “Un segundo vistazo al Códice de Xicotepec”. Itinerarios 11:55-83. 2011 “A curious commonality among some eastern basin of Mexico and eastern Mexican pictorial manuscripts”. Estudios de Cultura Náhuatl, 41:259-79. 2012 “Exploring Three Sixteenth-Century ‘Totonac’ Pictorial Manuscripts”. In: Amos Megged y Stephanie Wood (eds.) Mesoamerican Memory: Comparative Studies in Systems of Remembrance. Norman, University of Oklahoma Press. 2013 “Improving Western Historiography of Texcoco.” In Jongsoo Lee and Galen Brokaw (eds.) Texcoco: Prehispanic and Colonial Perspectives. Boulder, University Press of Colorado.